Welcome to Williamstown Imperials Cricket Club. We are based in the inner-western suburbs of Melbourne, Victoria just 10km from the famous Melbourne Cricket Ground. Fearon Reserve is our home ground, located in the historic bayside suburb of Williamstown. A 'six over square leg' finds you at Williamstown Beach. 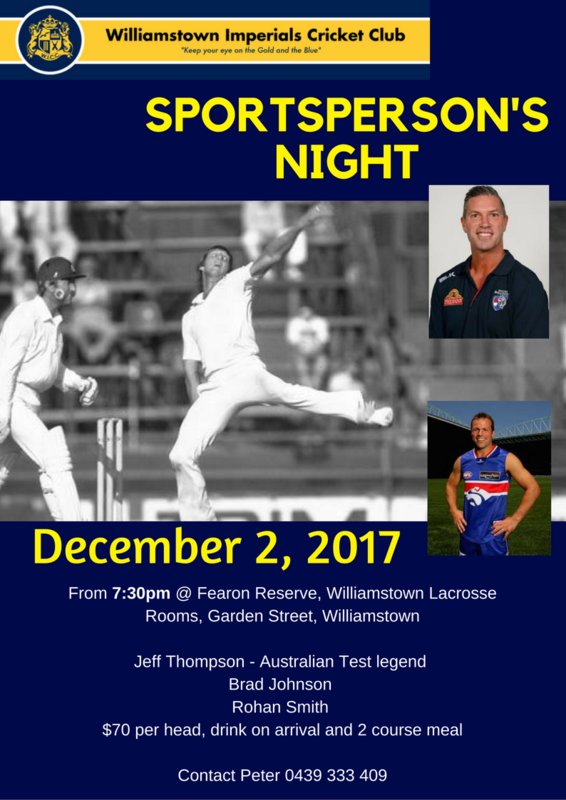 ​Williamstown Imperials Cricket Club would like to invite you to their Sportsperson's night on December 2. Our guest speakers will be Australian Test Cricketing legend, Jeff Thompson as well as Bulldog greats and 300 gamers, Brad Johnson and Rohan Smith. $70 per head. Drink on arrival and a two course meal. Please Contact Peter on 0439 333 409 for tickets to this event. Our quest for Back to Back for Williamstown Imperials CC has been underway for two months now and we now know who we play in Round one. St Andrews Pascoe Vale will venture to our home by the bay at the Fearon for Round one. This season has seen many highs for the club and also many individual highs. This season saw 4 separate hundreds made and a number of 5 wicket hauls taken. This season saw all three of our senior sides make the finals, with our firsts and seconds making it through to Grand Finals. Our first's broke their premiership drought of 23 years with a hard fought win over Seabrook. We would like to congratulate the following players for their seasons and their awards they took home this year. Captain Coach Lee Elmore has taken out the West A1 competition medal, voted the best player in the league. Elmore took out the prized award with 28 votes, one ahead of Seabrook captain Leigh Edwards. Elmore had a fine season, not only being the first Captain or Coach to bring home a First XI flag to the Fearon, but also being named Captain of the West A1 team of the Year side also. Elmore throughout the season, had an ability to change a game when needed either with the bat or the ball. He made 280 runs at 21.54 with the bat, and 33 wickets at an impressive 9.88 average with the ball with best figures of 6/20 against County West. Elmore struggled throughout the season with underlying injuries with his shoulder, but stood up when needed, bowling through the pain to put his side in winning positions. Elmore demonstrated time and time and again his leadership and experience through taking wickets at times of need. His best performance no doubt came against Williamstown Colts where he took 5/8 in 10 overs. He also showed his dominance on a flat track against Bellbridge early in the season taking 4/19 off 17 overs. Elmore was joined in the team of the year by two other Williamstown Imperials players. Peter Herrick and Glen Robson. Both players finished in the top 10 for the competition medal also. Herrick finished the season with a tally of 597 runs at an average of 74.63 in 11 games with two hundreds to his name. Whilst Robson amassed 407 runs at an average with 45.22 with one hundred to his name. Robson also took 24 wickets at an average of 8.88 from his 115 overs bowled throughout the season. Both undoubtably had great years to support Elmore. We would like to congratulate all three players on their year. It was 23 years in the making, our clubs first 1st XI flag since the 1992/93 season. Lee Elmore led his chargers into the final as favorites against Seabrook CC in the West A1 Grand Final who were playing in their first Grand Final in over 3o years. The Grand Final was played over four days at Saltwater Reserve in Point Cook. Our boys went into the game full of confidence after beating one of the flag favorites in the Semi Final, Melton Centrals. Seabrook's captain, Leigh Edwards won the toss and elected to bat. The day almost got off to the best start possible if not for a drop catch in the very first over of the day. Our bowlers toiled hard in the 133.2 overs they had to bowl which meant that the Imps where in the field for a day and a half. Had it not been for many dropped chances, the Imps may have been batting a lot sooner. Luke Fossett was the pick of our bowlers taking 3/36 off his 29 overs, which included 21 maidens. Luke Hudson, Ben Butcher and Michael McCullagh taking two each. The bowlers restricted Seabrook to 231 off their 133.2 overs in the heat over a day and a half. It was over to the batters to get the job done, and the Imps got off to a flyer. Peter Herrick and Daniel Slattery put on 48 before Herrick was dismissed for 30 before drinks in the third session of day two. at the close of play day two, the Imperials where in a fight being 4/100 with Glenn Robson and Lee Elmore at the crease. Partnerships where the key for day three, and the skipper (Elmore) and club legend (Robson) where up for the challenge heading into the days play. Elmore fell when the score was on 104, which brought Rob Gibbins to the crease fresh from hitting the winning runs in the Semi Final. He and Robson added 56 for the 7th wicket before Robson fell on 68 with the score at 160. Gibbins fell when the score was on 185 which brought Hudson and Butcher to the crease together. Still needing 62 runs to win Hudson and Butcher built a partnership and etched towards the total. At stumps on day three, the Imps had only five runs to make to win first innings points. Hudson and Butcher strode to the crease on day four full of confidence, knowing that the Seabrook bowlers would throw everything at them. Butcher fell early and McCullagh joined Hudson. McCullagh decided that he didn't want this to be drawn out any longer and tried to hit one out of the park for a dot ball. The next over Hudson got a single bringing McCullagh on strike with one to tie and two to win, he smashed the ball through mid wicket to get back for a second run. 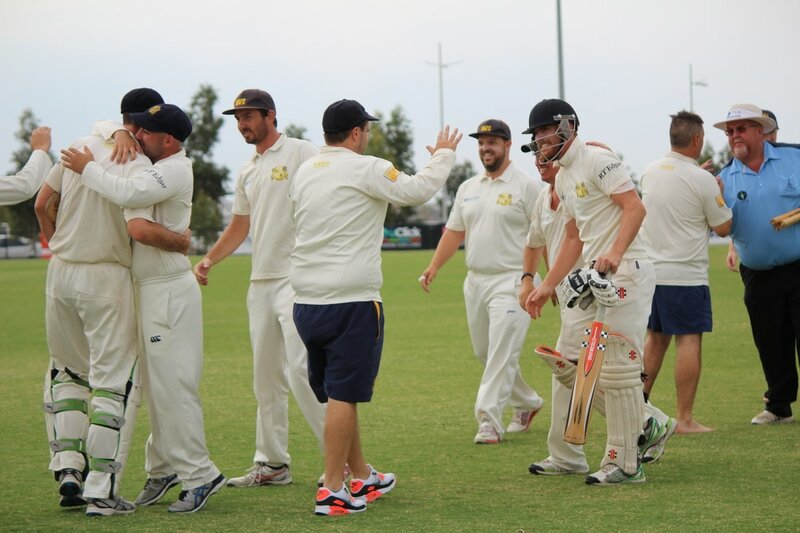 The scenes were of joy and jubilation on the sidelines with Seabrook not wanting to play a second innings to try and reverse the result, which left the Imperials crowned Premiers for season 2016/17. Luke Hudson went on to win player of the match with his 2 wickets and 33 not out to guide the side to victory. Unfortunately, the 2nd XI were not able to come up trumps in their Grand Final Clash against Gellibrand. Gellibrand batted first with our key wicket takers were Brett Pearce with 4/52 off his 22.2 overs, Shiven Nayyar with 3/50 off 17 overs and Ciaran Hayes 2/50 off his 20 overs. The Imps restricted Gellibrand to 195. The Imps batters were not able to get this score, only managing 125 with Pearce top scoring with 37 not out and was supported by Brenton Fletcher with 32. This result will no doubt drive our players to further success in 2017/18. We would like to congratulate all players that took part in the 2nd XI finals campaign. Our 3rd XI competed well all season to be bundled out in the Semi Final to West Newport in a heart breaking game for our boys. They were 7 runs short at the end of the days play in the One Day competition. Matt Jones was the pick of our bowlers with 2/45 off 7 overs whilst Stuart Richardson top scored with 48 and was supported by Paul O'Keefe with 44 and Lee Hayes with 34. We also congratulate our third XI players for their season and finals campaign. Three senior sides in finals, one premiership, one runner up and a semi final game demonstrates the success the club witnessed this year. We would like to take this opportunity to thank everyone involved in our year, our sponsors, our committee, our supporters and families. We look forward to preseason for next season. Go Imps! It was a day full of smiles in what was a great day and which the club is very proud of all the kids in the way they got involved and were committed to having a go despite the crowd and many distractions. There were a heap of photos taken today, which are accessabile in our new photos section of the website. If parents have any that they have taken that you would like to add to the pool to share, please let us know. The Hobsons Bay Council has provided the club with an update as to the progress of ground works at the Fearon Reserve. Please click on the file below to access this update - onwards and upwards Imps! !